Celebrating the bicentenary of Lachlan Macquarie's governorship of New South Wales (1810-1821), this issue celebrates his vision, enlightened policies and building programme, which helped improve the colony. 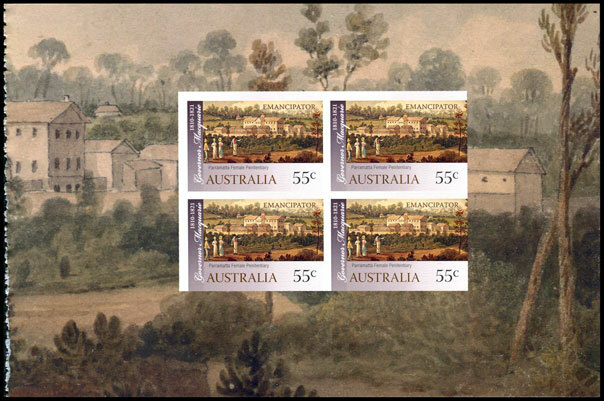 This is the not the first issue to celebrate Macquarie, with a booklet stamp in 1970. 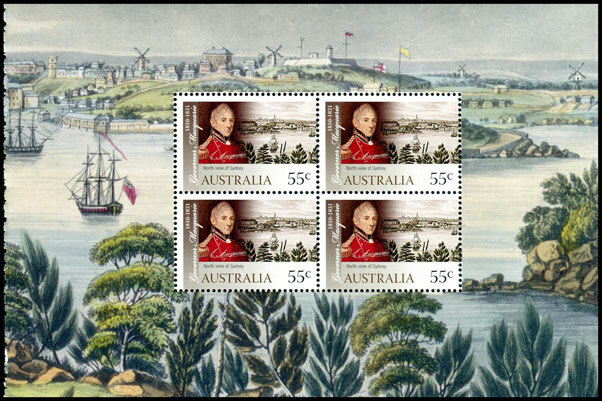 Macquarie Lighthouse (shown on a stamp in 1968), is also named after him. 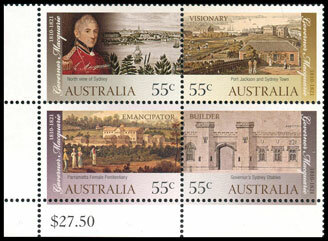 The four stamps are issued in a block of four. 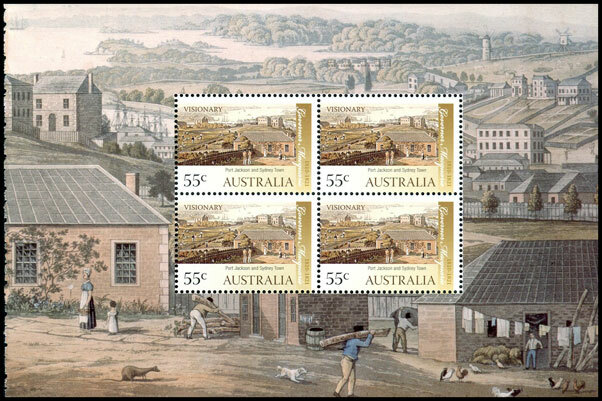 The sheet stamps will be issued in sheets of 50 stamps (2 panes of 25 (5 x 5) with a Sydney scene in the gutter). 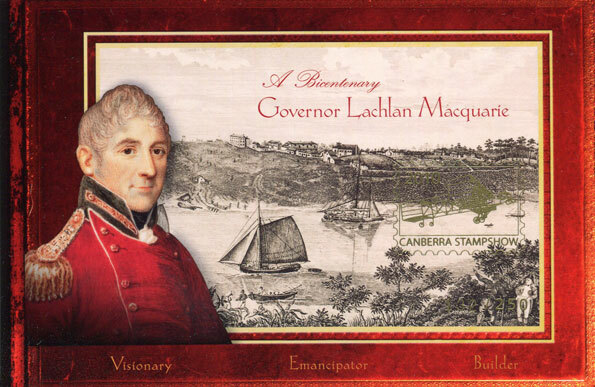 The gutter strip shows a view of Sydney during Macquarie's governorship. Having examined many sheet stamps, and seven prestige booklets (both perforated and imperforated), I've noticed that three of the prestige booklet stamps are subtly different to the sheet stamps. Then looking under UV light, all four stamps from the prestige booklet have a duller reaction compared to the sheet stamps. Interestingly, the same differences exist between the sheet and prestige booklet stamps from 2009's Favourite Stamps issue (see the image below). Sheet stamp has more brown in background image. Macquarie's face and wavy lines top right are also darker on the sheet stamp. Sheet stamp has more brown in background image (particularly noticeable in the house bricks). Vertical strip is darker on sheet stamp. Sheet stamp has a brownish tint. Stables image is darker on sheet stamp. 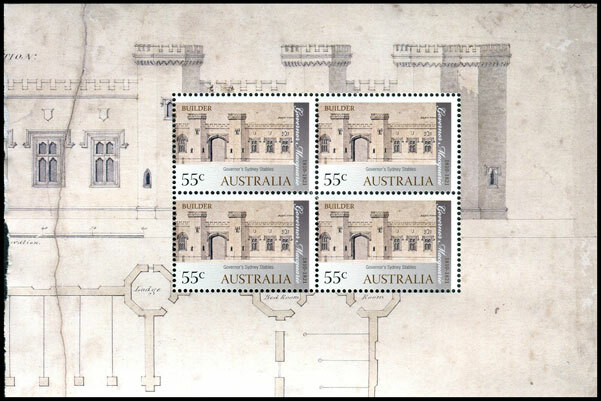 On sheet stamp solid colour behind 'AUSTRALIA' is brownish-grey; on booklet stamp solid colour is grey. The difference in reaction under UV light is similar to the 2009 Favourite Stamps issue. 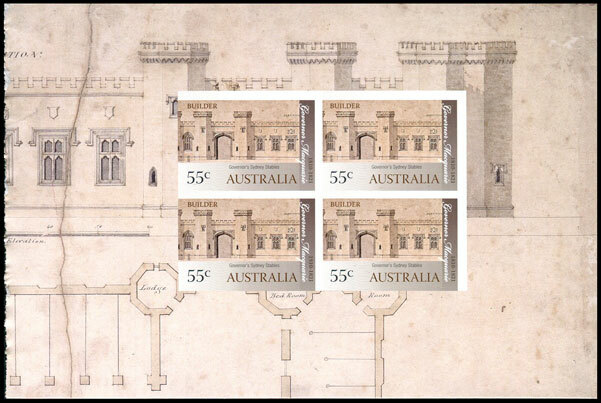 The prestige booklet contains four panes, with each stamp in an individual block of four. The booklet issued on 16 February 2010 contains perforated stamps. 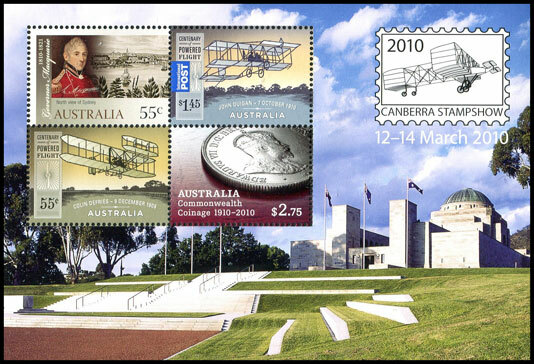 The prestige booklet issued on 16 February 2010 contain four perforated panes of stamps. 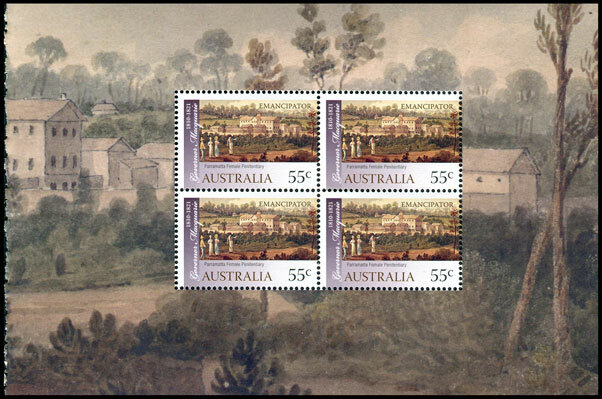 Limited to 250 booklets, and only sold at the Canberra Show, this prestige booklet will contain imperforate panes. 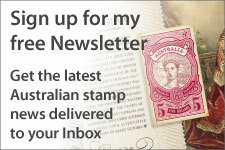 More information is on my Canberra Stamp Show page. 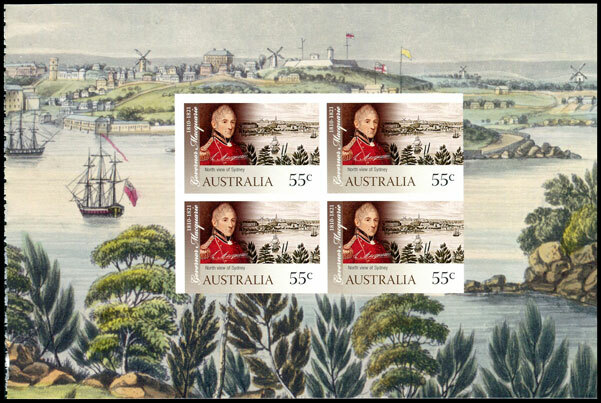 The Governor Macquarie stamp was also issued in the Canberra Stamp Show miniature sheet. 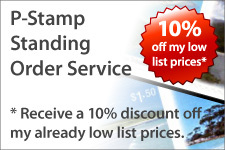 This stamp is distinctly different to the sheet and prestige booklet stamps, with more grey in the sky. The miniature sheet is printed by RA Printing. 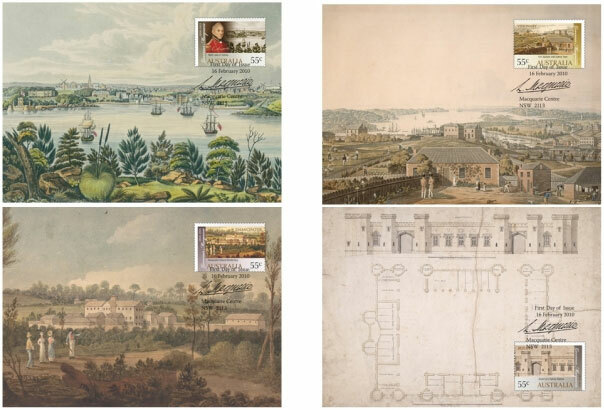 Four maximum cards, each featuring one of the stamps and the scene on the stamp will be issued. Images will be posted here when available. 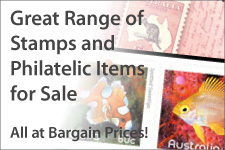 * As sales were limited to one per ticket, per day, it is unlikely that a collector could obtain four imperforate prestige booklets at their issue price.